My baby girl's nursery was decorated using ideas that I Googled and combined to create a dream come true. My baby girl, Amity's purple nursery was decorated using ideas that I "Googled". My favourite colour is purple so I just searched for some baby nursery ideas in lavender and purple and put them all together in my very own dream nursery design. Some of my favorite features in Amity's room are the wooden letters that spell her name. I arranged them in an arch to achieve the best visual within the space. 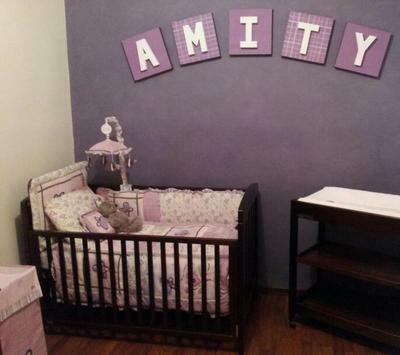 See more purple baby nursery decorating ideas that we have for you in our photo gallery. The backgrounds of each letter alternate from plaid to a solid color that complements the baby bedding set and the wall paint color. Go Here to See More purple items to use in your project. I hope that visitors to Unique Baby Gear Ideaslike my purple nursery pictures and can use some of my ideas to develop their own baby nursery themes where this color will really stand out. We are working on a room in a lavender, white and purple with no pink at all for our daughter and we like your tips very much. Thanks for the assistance. Join in and write your own page! It's easy to do. How? Simply click here to return to PURPLE NURSERY PICS.